Daily Monitor — Security agencies have warned that Ugandans in the diaspora who utter statements that disturb the peace, quiet or right of privacy of any person especially leaders, will be dealt with when they return home. Mr Vicent Ssekatte, the spokesman of the Directorate of Criminal Investigation, said detectives are still analysing the suspected offensive communication by Mr Kajubi. “He has been given bond and has deposited his passport with the police and it will be given back to him when investigations are complete,” Mr Ssekatte said yesterday. This means Mr Kajubi cannot travel abroad any time soon to fend for his family, with police sometimes taking months before completing investigations. Mr Steven Ssenkeezi, a lawyer, said the police may use a claim that statements done abroad extended to the jurisdiction of Uganda. “When a person does something out of the country but extends to the jurisdiction of Uganda, the police might arrest you here. 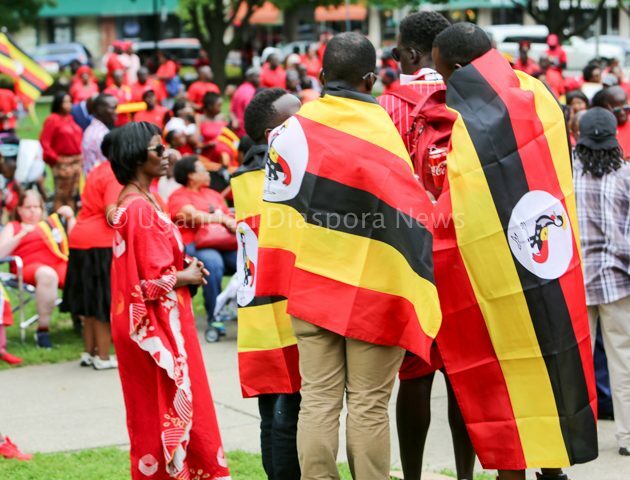 They used it during the treason case of Dr Aggrey Kiyingi where they claimed he sponsored Allied Democratic Forces (ADF) in Kenya,” Mr Ssenkeezi said yesterday when Saturday Monitor sought his opinion on the matter. Summoned. In June, police summoned Raymond Soulfa, alias Peng Peng, and Mukono Municipality MP Betty Nambooze, who are alleged to have committed offensive communication when they made statements about the death of Ibrahim Abiriga, the slain former Arua Municipality MP. Peng Peng, who stays in Sweden, has not reported to the police. Pending. Detectives say his file is still pending and he will be arrested and his statement recorded once he sets foot in Uganda. Below is a link to the Boston protests that attracted more than 1000 Ugandans. Similar protests were held in London – UK, Toronto – Canada, Copenhagen – Denmark, Munich – Germany, Pretoria – SA, Melbourne – Australia, Vienna – Austria and several cities across the USA. Source Daily Monitor and NTV video.